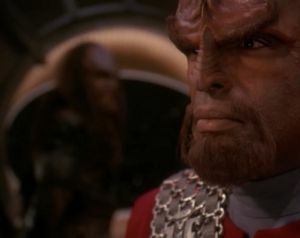 Worf's brother Kurn comes to Deep Space Nine and begs Worf to help him commit suicide. Flirting between Worf and Dax seems to come pretty naturally to both characters. Sisko shouting at Worf and Dax is intense, and I love how Sisko reacts to events, again demonstrating a very different approach that either Kirk or Picard. It's damn cold for Odo to fire Kurn because of his death wish, mere hours after telling Worf what a surprisingly good security officer he was. There is no way forcefully taking away Kurn's memories is legal. At the least, they should have gotten Kurn's consent. Worf says he has no family. I bet that would come as a big surprise to his adoptive parents, not to mention his son. I love the idea of a cloaked, remotely-armed mine field. That's clever. Still, I don't understand why the Klingons agree to the Defiant's offer of medical assistance back at DS9. They have to know that will give the Federation enough information to figure it out, and it's definitely out of character for them to accept help. This is a fantastic episode in terms of building Worf's character and showing the repercussions of his decisions in "The Way of the Warrior." It is certainly a more logical treatment than "The Sword of Kahless." However, though I hate to bring up an episode I dislike so much, Worf doesn't reflect on the lessons he learned in "Ethics," in which he was just as eager to die as Kurn is here. My biggest problem with "Sons of Mogh," though, is the ending. It comes out of nowhere, lacks adequate explanation (why, for example, does this other Klingon family agree to it? ), and feels like a sci-fi deus ex machina. Also, if you take this episode as a parable about how to deal with someone contemplating suicide, the answer provided isn't terribly helpful in the real world. At the end of "Sins of the Father," Picard tells Kurn, "do not forget what [Worf] does here today." Oops. "It was even said that, if Gowron died, the leadership of the council might be passed to someone from the House of Mogh." Nice, ironic bit of foreshadowing, considering what happens in "Tacking Into the Wind." Technically, leadership is passed to the House of Martok, of which Worf is a member at that point, but leadership still goes to Worf.